It's Friday, so it must be time for the round-up! 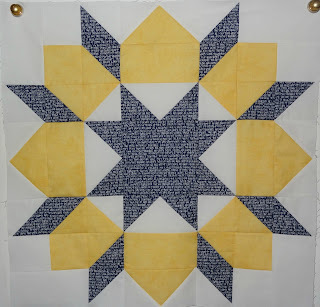 Amy finished this stunning "Drunkard's Dice" quilt. Amazing colors! Debbie has a quilt featured in the latest edition of Modern Patchwork! Whoop whoop!! 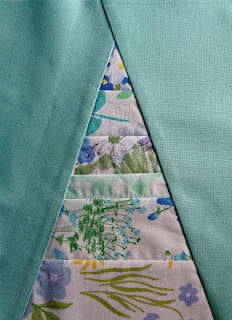 I posted a tutorial for my Trapezoids at Work quilt-top. Pam's hosting a Tula Pink swap if anyone's interested in joining. Lynn published her first pattern on Craftsy! 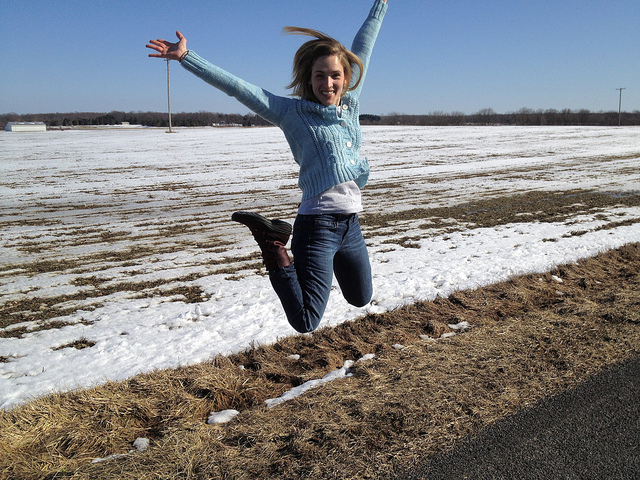 It looks awesome and Jenna even tested the pattern earlier this year. Congrats! Ronit's been figuring out how to piece Hebrew letters. We had a very nice meeting last night. Many welcome, new faces. Bring your Madrona Road challenge entries and your Round Robin projects. Bring any books you'd like to donate to the A2MQG Library. Bring your unloved fabric for the swap. Rossie distributed membership information to the guests. Rossie proposed spending roughly $80 for the printing of bookmarks, membership cards, and rack cards. The membership approved. The remaining spots are now open to those interested from other guilds. First come, first serve for the remaining spots. The cost for the retreat without prepared meals is $110. Should those attending bring potluck provisions, or should they use the Hankerd's Inn meals? An email thread will decide. Checks will be cashed when we are approved. 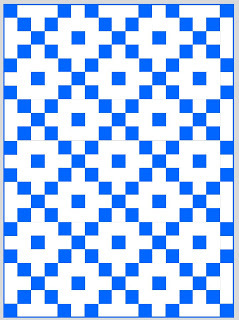 120" perimeter, quilted and bound quilts to be shown at the next (April) meeting. Kathy and Jenna will bring quilt stands and Courtney will bring curtain clips. Jenna will bring a camera. No set date for the blog post. We still need to bind the blankets, take nice pictures, pick a charity, and set-up the auction details. Jenna and Jen B. proposed working through the eBay Giving Works program and one of their established organizations from the Ann Arbor Area. Jenna will contact the Habitat for Humanity of Huron Valley and see if they are open to working with us on promoting the auction. What are our future charitable activity plans? Perhaps working with the Ozone house? Or Margaret's Hope Chest? Or seeing if we can make this Spoonflower auction relationship take place annually? Art Spark Challenge! The NW Ohio MQG will be hosting a visit to the Toledo Art Museum on Sunday, April 7th at 12:30pm. 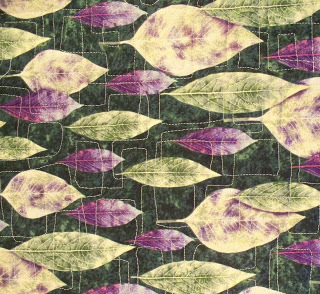 The challenge is to find an inspiration piece, and then make a quilt! The challenge runs formally from May 1st - August 1st. There will be a flickr groups and prizes. Jenna is contacting Lucinda for a meet-up spot. We'll do an email thread to organize a car-pool. Amy collected some book donations for the library. Rossie knows a printer who will make bookplates with our logo to put on the covers of the library books. The library will be stored at Pink Castle Fabrics, but will only be accessible during Guild Meetings. 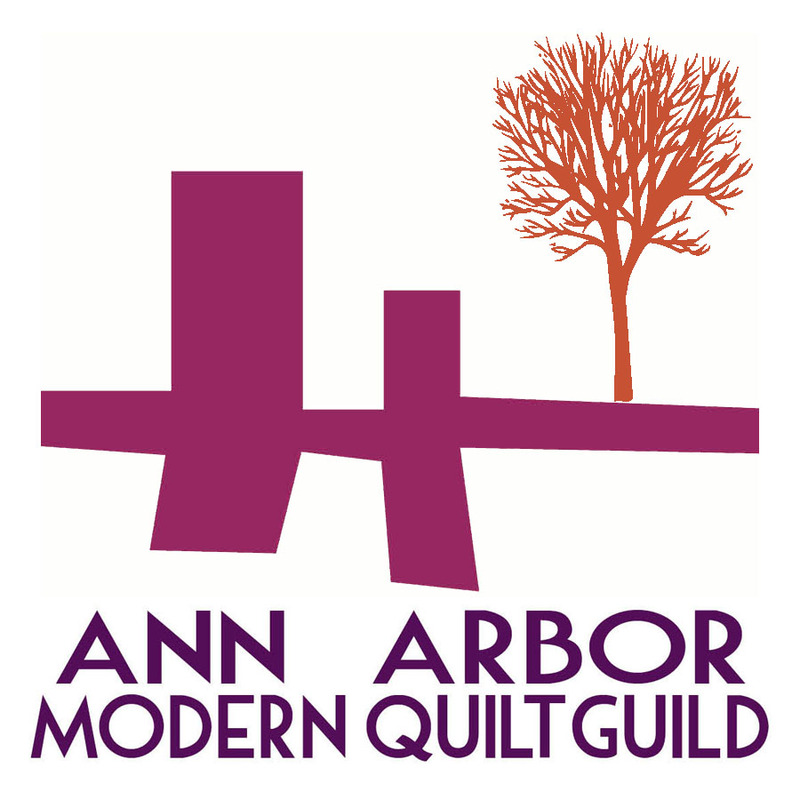 The National Modern Quild Guild: Should our guild join by paying membership dues? With an estimated paying membership of 16-20 members, there would be a cost of roughly $15 per person that could either be paid individually, or taken from our budget, or covered through a fundraising activity. Jenna will post more about this proposal, including the pros and cons, on the blog soon. We intend to vote on this issue at the May meeting, but there will be the option to vote to delay the vote. 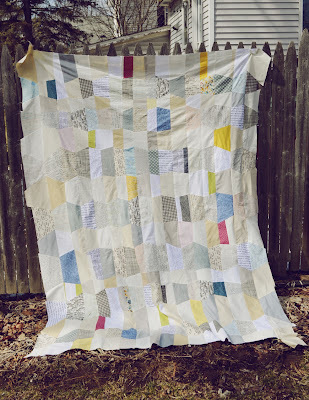 April Fabric Swap: Bring your unloved, dead-to-you quilting fabric. Yardage, fat quarters, organized scraps... All fabric sizes are welcome. If you are able to identify if the fabric has been pre-washed, or the name/manufacturer of the fabric, please label that information onto the fabric. Meeting / Sew-In Locations: Please keep an eye on the blog and/or the Facebook page. We will soon be moving our Guild activities to the new Pink Castle Fabrics shop. Dorie Lead a Brainstorming session for future swaps/challenges. Is anyone going to Cincinnati for the international quilt festival? Doesn't seem like it. Debbie will present future Modern Quilting definition talking points. Debbie may present the differences between the current and past definitions. 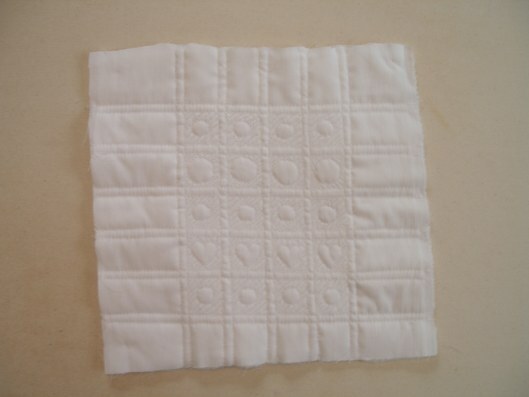 Quilt Help? : Jenna asked a few questions about making fabrics through Spoonflower. Here's a reminder that deposits ($50) are due for the retreat at the meeting tomorrow (WEdnesday - 3/27 at 6:30pm at MakerWorks). I would prefer checks made out to the Hankerd Inn. This is for the a2mqg Sewing Retreat at the Hankerd Inn. More information here. Meeting Wednesday - Pink Castle Fabrics Preview! Meeting on Wednesday at 6:30pm at MakerWorks. If you would like a special preview tour of Pink Castle Fabric's new store, come early to 3808 Plaza Dr. very close to MakerWorks at 6pm. It's that time of the week, everyone ready for the round-up?? 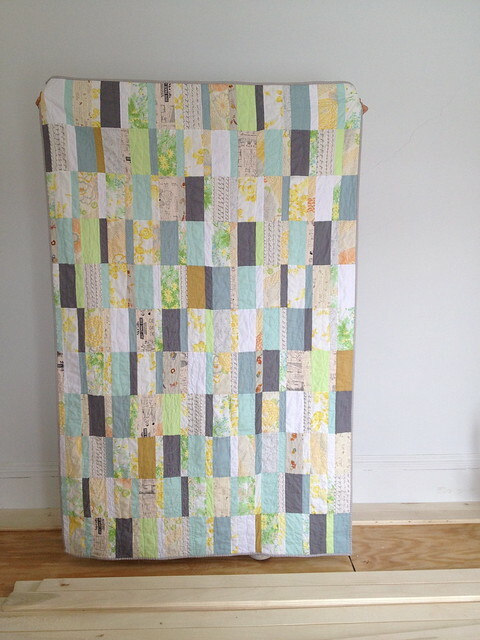 Dorie got the finished up this awesome low volume quilt that she quilted at the retreat in January! Pam's been "swooning" in navy and yellow! Debbie's been cranking out these lovely Bella plus blocks! and has taken the plunge into free-motion quilting! Looks great! and I (Jenna) finally posted another entry into my Modern Art series! Meeting next Wednesday - 3/27! 6:30pm at Maker Works. Guild members, do you have fabric that has been hanging out in your stash for a little too long? Maybe these are things you no longer care for or projects scraps that you're just sick of seeing. If you'd like to rid yourself of these fabrics and perhaps acquire new ones, please bring them to our April guild meeting. The swap will work like this: Upon arrival at the meeting, put your fabrics on the designated table. When the agenda gets to "swap time", we can all get up to peruse and choose from the table. I think we can all manage to hold ourselves together and not act like warehouse sale crazies grabbing hunks of free fabric. At the end of the meeting, you have the option of taking your unclaimed fabric back home or donating it. Lynn knows several groups that make quilts for charities including the Ann Arbor VA hospital, Livingston County WIC, Safe House in Ann Arbor, and the Chelsea Senior Center, and she has agreed to transport the extra fabric. Thanks Lynn! If you want your fabric back, please label it with your name. Bonus points to you for labeling any fabric with the line/designer name and whether or not it was washed. 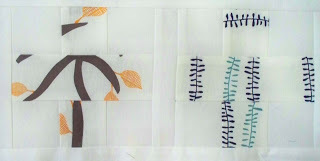 Amy blogs about her batik production from the past couple of months. We loved seeing these skulls at the last meeting! Jen B. is continuing her series on Quilting and the Law - this time focusing on Copyright and Patterns! Debbie is kicking off her scrap-management quilt! Rossie has a debriefing post about her hectic past couple of weeks. 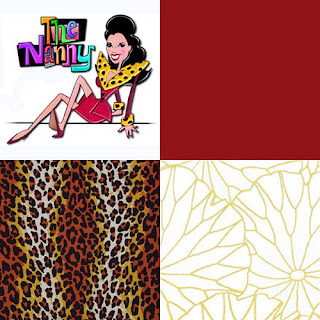 Is anyone else SO EXCITED to see "The Nanny" quilt take-shape? Dorie knit a sweater! She's adorable. 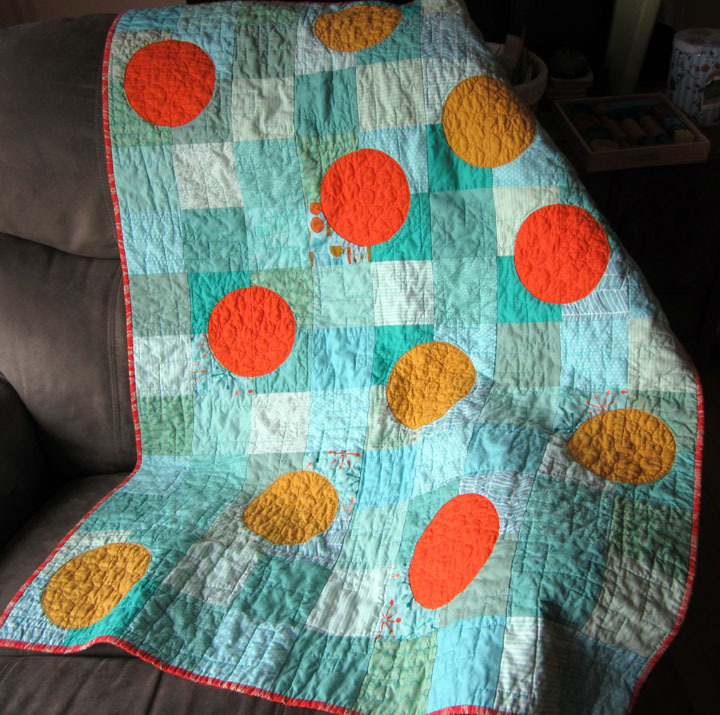 Despite my lack of blogging, I've been quilting! Too busy sewing to write, but I'll remedy that soon. Happy St. Patrick's Day! I'm already wasted! Sew-In today! 12-4pm at MakerWorks (remember DST- Spring forward!). Free for members, $5 for drop-ins. The next retreat is scheduled for June 28 – 30. Please see the post from February 19 for details. For more information about the Hankerd Inn you can visit their website at http://www.hankerdinnresort.com/ . If you plan to attend, a deposit of $50 is due to me at the March meeting. I prefer checks made out to the Hankerd Inn. If you will not be at the meeting, please contact me to make other arrangements for your deposit and to reserve your space. We are planning to open the retreat to non-members after the March meeting. There are only 18 beds in the barn, so the spaces may fill up. The price per person without meals is $110 for Friday thru Sunday. Thursday night is $35 without meals. We will be discussing participation in the meal plan at the March meeting. 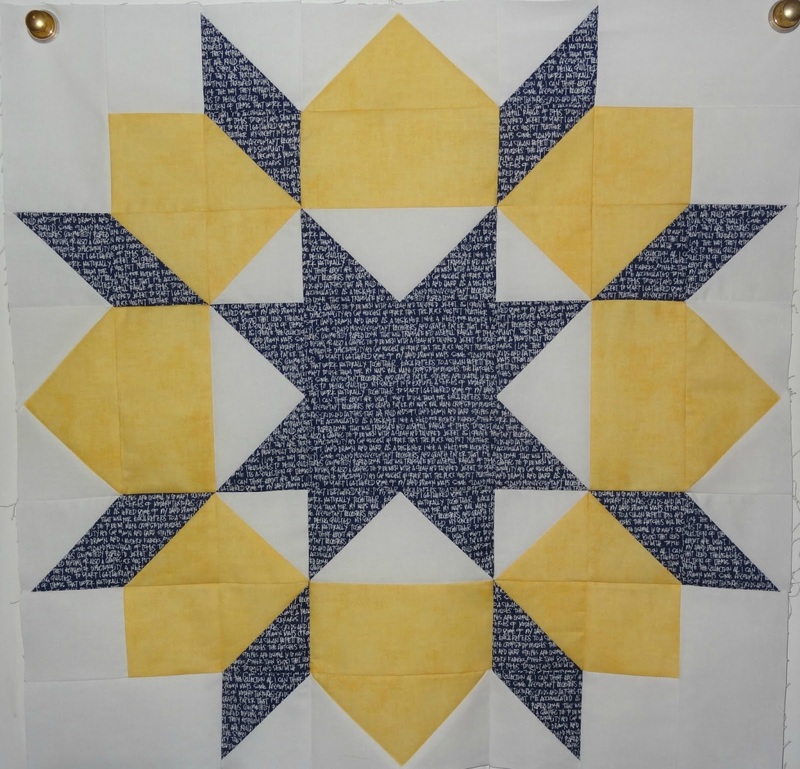 The MotherShip reports that there is a call for entries for the International Quilt Festival! The deadline is April 26, 2013. AGH! I forgot the Weekly Round-Up last week. That's on me. And now that our By-Laws are approved, I truly am at risk of impeachment. Forgiveness, I beg you! Jen has kicked off a great series called Quilting and the Law. This is something in which I've been very interested; the first post is on copyright. 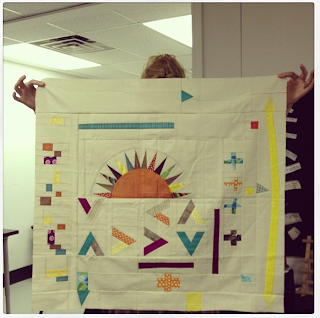 Amy D. has her QuiltCon recap posted! Debbie has started a project based on an inspiration photo of a building. This was started at QuiltCon in Jacquie Gering's "Building Bridges" class. 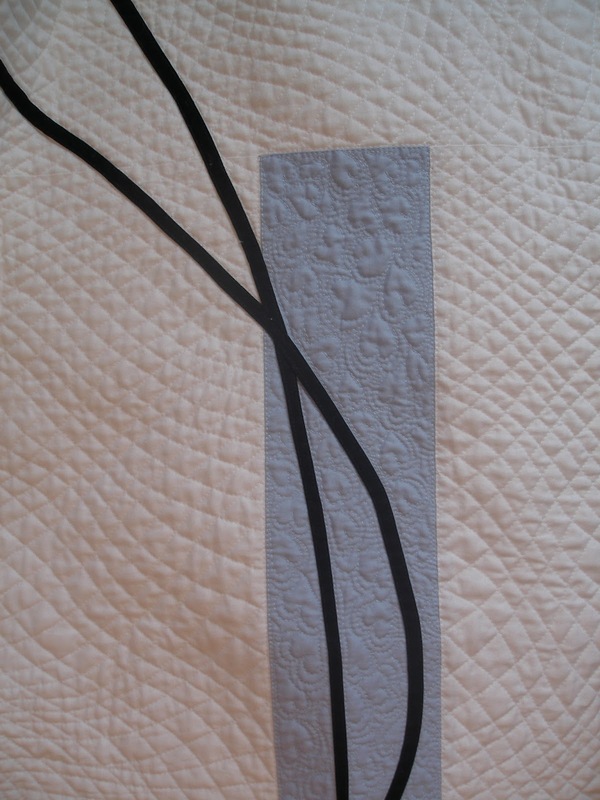 and she has this very thought-provoking post about finding her own Quilting Voice. I've been focusing on garment sewing for a bit, making a Tova and a jersey dress. Pam's been working on some great tree themed bee blocks. ... AND finishing this awesome red and white quilt. Dorie captured her thoughts on QuiltCon. Ronit made a sweet little quilt "garnished" with a log cabin. Until I am replaced next time!